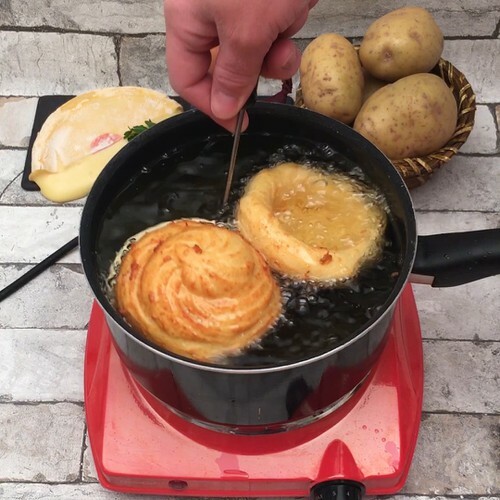 Peel and cook the potatoes in boiling water. Use a sieve to grate the potatoes into a mash. Mix the mash with the eggs, flour and olive oil. Place the mix in a piping bag and pipe around an upturned muffin tin. Form cup shapes over the compartments. Place them in the freezer for 3 hours to set solid. Remove the frozen cups from the tin and fry them in hot oil for 2-3 minutes. Add cubes of cheese, chopped onion, a spoon of sour cream and the cooked bacon pieces into the middle of each cup. Bake the cups in the oven for 15 minutes at 180°C. Serve warm.